Imagine a newly married couple who’s interested in buying a home. They talk to their friends and family about how they should go about it and suddenly are presented with a seemingly wonderful option. A good friend of theirs has a home for sale. The friend explains that they can save time and money by buying from him because they won’t have to use a realtor or a title company. They can simply visit a county office, transfer ownership, and wire him the money for it. Some years later, they get a call about something that is still owed on the property and that it’s their responsibility to pay it. Because they didn’t go through a title company and purchase Saint George title insurance when they originally bought their home, there’s nothing they can do. A proper title insurance policy would have saved this couple from this unfortunate and surprising responsibility. When it comes to St George title insurance, policies come in two forms: the lender’s policy and the owner’s policy. It’s important to have both. Both types provide protection against issues that may arise concerning legal ownership status of the property or any potential title problem. 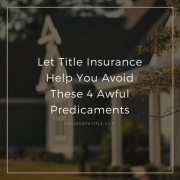 As thorough as a title company may be during the approval process, unforeseen circumstances do sometimes happen that are outside the title company’s control. This is where St George title insurance comes in. Here are some relatively common situations where St George title insurance saves your bacon. One possible scenario that homeowners can find themselves in is one where suddenly a person shows up or contacts you claiming they are an ex-spouse or distant relative of the previous owner and that they have ownership claim on the property. In these situations, the individual will usually attempt to prove that the person who sold the home had no right to do so. If a judge rules in favor of this person, let’s hope that you have owner’s title insurance and not just lender’s. Owner’s title insurance will cover court costs, attorney’s fees, and other financial losses, no matter if you have to negotiate with the person, buy them out, have to forfeit your down payment, or whatever the ruling may be. The right St George title insurance is extremely important in a situation like this. Some new homeowners have found themselves in an unusual situation that involves a neighbor putting up a pool, shed, deck, or fence, or extending their driveway on your property before they’ve closed on their new property. This can be inadvertent or deliberate depending on the circumstance. St George title insurance will cover costs associated with any settlement efforts, striving to resolve the matter out of court and get the encroaching element of your property. This is the situation described in the introduction of this article. St George title insurance providers can be as meticulous as can be and yet still, because of the off-chance that a county recorder incorrectly posted or filed something, a title issue can arise later for the homeowner. In a situation like the one illustrated above, St George title insurance is of the utmost importance because the policy will simply pay that hidden mortgage after a claim is filed. When it comes to property taxes, new homeowners should be prepared, as unlikely as it may be, for the possible surfacing of delinquent back taxes after closing. Preliminary tax searches may show the property has no delinquent taxes, but there’s still a small chance something could come up. Proper St George title insurance will take care of this. In the state of Utah, both lender’s and owner’s title insurance policies are required so that you are covered in situations like the ones described here.